Believe it or not, monopolies still exist. Here's how investors can benefit. The word "monopoly" comes with certain negative connotations. Monopolies, it is said, are anti-consumer and often lead to a stifling of innovation. The debate over the pros and cons is endless, but one characteristic of monopolies cannot be denied: They are extraordinarily profitable. This is perhaps why the most famous investor of our day, Warren Buffett, speaks glowingly of owning businesses with monopolistic characteristics. Of course, literal monopolies were outlawed at turn of the 20th century via the Sherman Antitrust Act. However, all is not lost for the would-be monopolist investor. There are still a handful of companies out there that have monopoly-like characteristics, which (as one might expect) are fantastic stocks to own. Read on to see why our team of Foolish contributors thinks that Waste Management (NYSE:WM), Magellan Midstream Partners (NYSE:MMP), and Sirius XM Holdings (NASDAQ:SIRI) have such strong competitive advantages that they could be considered legal monopolies. Brian Feroldi: While putting money to work in a company that focuses on waste disposal might sound like a boring way to invest, it sure can be profitable. That's because most garbage collectors operate near monopolies, since it makes little economic sense to send multiple garbage trucks down the same roads to pick up trash. After all, garbage is heavy, holds little economic value, and is expensive to collect and transport. That gives companies that own landfills close to major cities a massive advantage over other operations. In turn, they tend to generate outsize profits over the long term. That's why I like Waste Management, the largest trash hauler in the U.S. This business owns several hundred landfills, transfer centers, and recycling centers throughout North America. In total, Waste Management counts more than 21 million customers in the U.S. and Canada. Waste Management has a long history of using its scale to generate predictable revenue and profit growth. That allows the business to throw off huge amounts of free cash flow that management generously passes on to shareholders in the form of an ever-rising dividend and regular share repurchases. 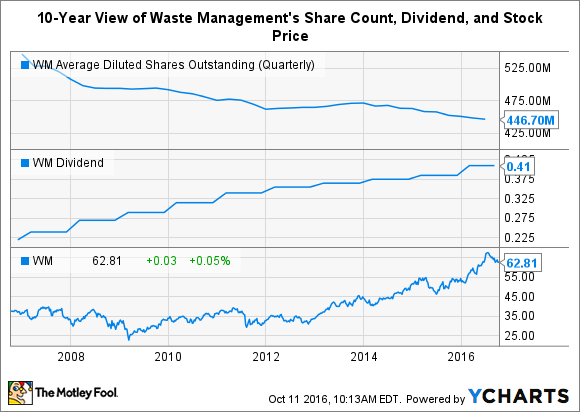 All in all, Waste Management operates a recession-proof business that will be generating strong returns for decades to come. With shares trading for about 20 times yearly earnings estimates and offering up a market-beating yield of 2.6%, this is a great stock for low-risk investors to consider. Tyler Crowe: In pretty much every aspect of the oil and gas industry, the competitive landscape is so fragmented that it's hard to find a company with a business so large and ubiquitous that it has the qualities of a monopoly. There is one exception to this, though: the business of refined-petroleum-product pipelines. Transporting and distributing gasoline and diesel from refineries, found mostly on the coasts, to demand centers around the U.S. mostly goes without competition. As a result, the Federal Energy Regulatory Commission regulates the prices pipeline owners can charge. Magellan Midstream Partners -- owner of the nation's largest refined-petroleum-product pipeline network -- covers a lot of territory across the country where its pipes are the only game in town, and thus fall under the regulation of FERC. These regulated pipes guarantee a certain rate of return for the business. For investors, that regulated business has been a large part of the reason that Magellan has been able to raise its payout by 12% annually since its IPO back in 2001. It also helps that the company's management has been very prudent about balancing the need to pay a high distribution to its unitholders -- today its yield stands at 4.7% -- and growing its business with high-return projects, to ensure that it can continue to pay shareholders. Sean Williams: If investing in legal monopolies is your thing, then consider turning your attention to Sirius XM Holdings, which holds a monopoly on U.S.-based satellite radio thanks to the merger of XM and Sirius in 2008. Is everything perfect for this satellite-radio monopoly? Not exactly. Sirius XM is still mired deep in debt and trying to slowly dig itself out. It ended the second quarter with $6.1 billion in debt, which is a reminder that launching satellites into orbit isn't cheap. Also, Sirius XM is facing increased streaming competition from the likes of Pandora (NYSE:P). Yet neither of these concerns should significantly worry investors. To begin with, Pandora's business model is built around advertising revenue. During the second quarter, Pandora's advertising revenue totaled $265.1 million of its $343 million in total revenue, and the company lost money. Sirius XM's business model is built around subscribers, with advertising revenue comprising less than 3% of second-quarter sales. Because it's subscriber-driven, Sirius XM is far less likely to see cash flow fluctuations as the economy grows and contracts, which may be an issue for a streaming service like Pandora. Sirius XM is also healthfully profitable. Costs are another important factor to consider. Yes, Sirius XM does have contract costs with its hosts, which in some cases can be a pretty penny. In 2006, shock jock Howard Stern received $500 million from the company to switch his popular talk show to satellite radio, and a recently renewed five-year deal is believed to be in that neighborhood, if not higher. But having a monopoly on orbiting satellites means that Sirius XM's costs to get that content into its receivers is the same no matter how many subscribers it has. It's not a perfectly fixed-cost business, but expenses are fairly predictable. And, of course, Sirius XM has brand-name lures, including Howard Stern, and an ongoing six-year deal with the National Football League that allows Sirius to broadcast every NFL game live through the 2022 Super Bowl. Combine all of this and you have a business model with strong pricing power, slow but steady subscriber growth, and relatively predictable costs. That could be a winning formula over the long run.